What Is eBay, and How Does It Work? The Internet spawned all kinds of online marketplaces (known as e-commerce sites to Wall Street types), and eBay is the superstar. The reason it remains the leader is simple: It’s the place where buyers look to do business with both big brands and small homespun businesses. eBay itself doesn‘t sell a thing. Instead, the site is a platform for selling and does what all good markets do: It creates a comfy environment that brings together buyers and sellers. You can think of eBay as the person who set you up on your last blind date — except the results are often a lot better. Your matchmaking friend doesn’t perform a marriage ceremony but does get you in the same room with your potential soulmate. eBay puts buyers and sellers in an e-commerce environment and lets them conduct their business safely within the rules that eBay has established. All you need to do to join eBay is fill out a few forms online and click. Congratulations — you’re a member with no fees or secret handshakes (you don’t pay a fee until you sell something). After you register, you can buy and sell anything that falls within the eBay rules and regulations. The eBay home page is your first step to finding all the cool stuff you can see and do on eBay. You can conduct searches, learn about current promotions, and get an instant link to the My eBay page, which helps you keep track of every item you have up for sale or have a bid on. Yikes! What happened? You say the eBay home page on your computer looks nothing like the one shown? Don’t rub your eyes — even squinting hard won’t help; eBay has a different version of the home page for those who have never registered on eBay — and customizes the page even if you’re not signed in. If you have never registered on eBay, someone else who uses the computer may have done so already. 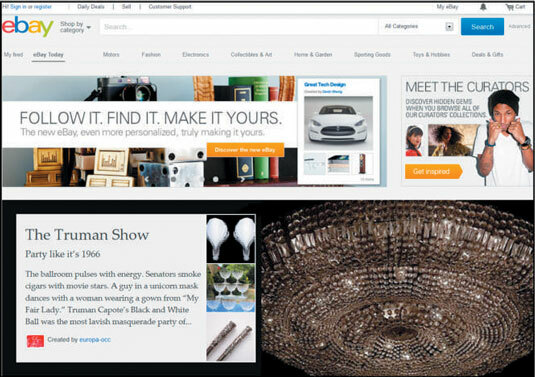 Know that whatever version of the eBay home page you view, it has the same basic elements.